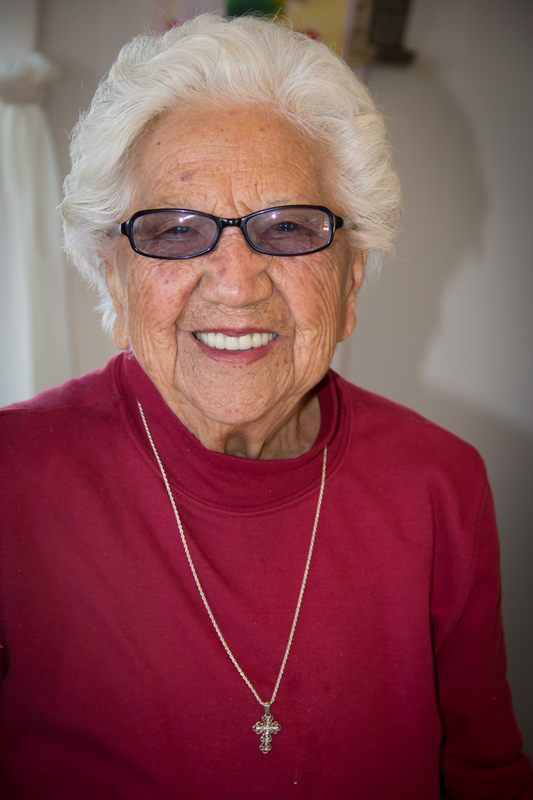 Rosenda Gallegos Rivera, also known as Rose, is now 99 years young and a lifelong resident of Amalia, New Mexico. Just a day shy of her 99th birthday, I sat down with ‘Hermana’ Rosenda (what she is lovingly referred to by everyone in town) and her daughter Marie. We sat at the cozy kitchen table of her home and talked. Rose is a tiny but bold woman whose laugh is unique and heard often. Rose is a fantastic woman who I had the pleasure to talk with her about her life in Amalia, NM. She has lived nowhere else and does not plan on it either. With lots of laughter and smiles, she told me about her life. Rose was born January 3, 1916. Her parents were Adolpho Gallegos and Beatrice Cardenas. Aldolpho Gallegos owned the only store in Amalia then. The store itself was located just a few minutes from Rosenda’s current home. Rose proudly boasted that you could find almost everything you needed in the little country store. Things you could find were groceries, clothes, shoes, farm supplies, and everything in- between. (They had large gardens for fresh vegetables and animals for meat). Rose recalls that the supplies to keep the store stocked with goods were brought in from Taos with a horse drawn wagon. Rose explained that back in those days a trip to Taos was an overnight stay. Her dad had to hire people to help him with the store and to make the trips to Taos. Rose’s mother, Beatrice, also helped in the store. 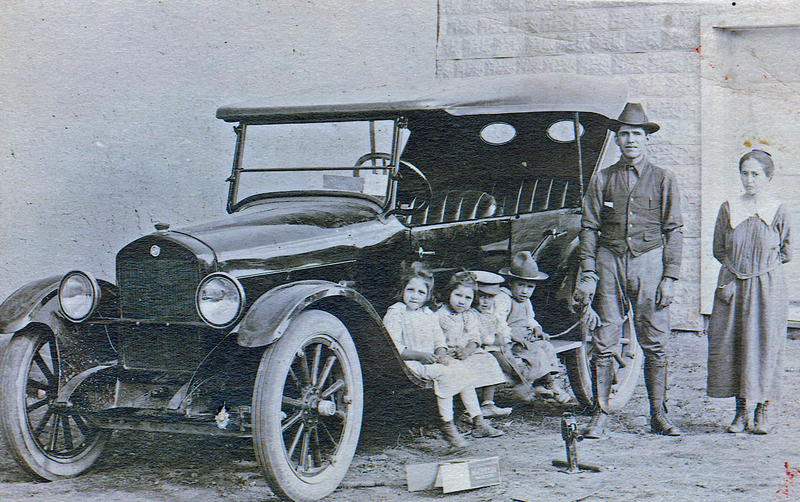 Rose remembers that her father was the first person in Amalia to own a car. Rosenda’s parents had eight children; five sons and three daughters. Rose was the second eldest of her brothers and sisters. Of those eight children, only two are living today, Rose and her brother, Rudolpho “Rudy” who also lives in Amalia. I asked Rose about her education, she said she went to school until the 6th grade; she attended school in Amalia, at ‘the old school.’ She said that she remembers a teacher named Celedoñio Trujillo who would walk to school from Costilla to teach school near where the Santo Niño Church is now located. She said, “That teacher was very dedicated to teaching.” Education was not essential to survival in the world back then. Children often left school at an early age because they needed to help support the family. Children often worked in fields picking potatoes and tending to the gardens, or tending to animals like sheep to keep their families fed. It was not uncommon to have little education, but they were literate. Most people spoke Spanish, but read and wrote in English. Attending Mass (this was a Catholic community) was expected, there was no slacking there. When I asked her if she ever wanted to be something else when she was a child or young woman, she said, “No, I was very content and very busy with my house, caring for my mother, grandmother, and my children.” She also pointed out that there were no jobs for women like there is now. “Women worked at home, and they worked very hard,” and with her well-known humor she continued, “If I don’t remember things it is because I worked too hard, and I do not want to remember it.” She also attributed her long life and good health to working hard. As I mentioned earlier, Rose has lived in Amalia all of her life. She worked very hard in her youth and young adult life. When she was young, it was her responsibility to clean her home (that of her parents) and the home of her grandmother; she tells me that it was very hard work. Not like cleaning the houses now, she says, “It is easy now and the houses are better.” We talked briefly about the ‘mantas’ that covered the ceilings and washing the ‘lana’ (wool) mattresses by hand. Doing laundry, she said, was a two-day job. It was done by hand and scrubbing the clothes in a ‘cajete’ (washtub). They made the soap too, like many other things. “It was hard work, not like now,” she says, “The gente now, this generation, could not survive back then. Life is too easy for them.” We discussed a few modern conveniences, like microwaves, washers, and indoor plumbing. “They do not know what hard work is; they don’t have to work hard.” She continued to say that if they had to go to the restroom, it was outside. It did not matter if there was snow or if it was dark, they had no choice but to go to the outhouse, “I doubt if this generation could handle it.” I have not laughed with an elderly woman as much as I did this day. She reminded me of how ‘lazy ’we have become. I am not saying that folks do not work, but our work is half done for us with the conveniences of modern technology. We have no concept of true survival off the land with not much more than bare hands and simple tools. We are a world with many things that help us do our daily chores. This country and this community was built on the backs of Rose’s generation and for that, we must show gratitude and respect. Rose’s generation had fun too. They attended dances she recalled. She remembered that the people who lived in Ventero, a small community North of Amalia, near the Stateline of Colorado, would come to dances even in the winter. Rose said that they would come on wagons with blankets to keep warm for the journey back home. When Rose was 18 years old, she married Ambrocio Rivera, the son of Julian Rivera and Miquelita Arellano. The dress she wore came from her father’s country store. The wedding itself was a two day affair. There was a celebration the day before the wedding called the ‘Prendorío’ and the day of the wedding was called the ‘Casorío.’ Rose and her husband were married in Costilla at the Sagrado Corazon Church on November 30, 1935. They had 6 children, 14 grandchildren, 23 great grandchildren and 6 great, great grandchildren. They were married for 48 years. Rose has outlived her husband and with joking ways, dancing eyes, and with her humor in full force, says to me, “I will never get married again, I don’t want to share my house; it is too hard.” In the early days, her husband supported their family by farming, later he became a carpenter. Rose did not learn to drive until she was 68, after her husband died. She did not drive far, just around Amalia and Costilla, and maybe to San Luis. She drove to the post office and to the senior center, but no more than that. Her first car was a Volkswagen Rabbit and now she owns a Geo Metro. She keeps it in the garage and from time to time, she and Marie take it for a ride. She quit driving around the age of 92 when her arthritis worsened. Rose has been a long-time familiar face at the Anciano Center. She has been a part of the program since its beginning in Amalia. To this day, Rose spends time daily with the exception of the weekends at the center volunteering and socializing with the community that she loves. Rose has great admiration for the center and the people there. And they reciprocate the same admiration for her. What I learned from Rose is life is hard work, you need family values, respect for yourself, respect for your family, respect your church, respect your community, and respect for the land that she worked very hard to survive on.